Below is the ECG of a 62yrs lady who complains of dizzy spells and palpitations. She is not on any medication and has no significant past medical history. What does this ECG show? Answer: Left Bundle Branch Block. 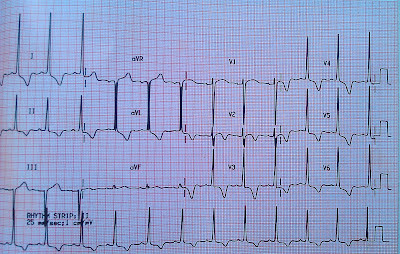 Note the widened QRS complex. P-waves are present (agree, not clearly seen, because of baseline interference). P-waves are usually seen best in V1, so if you are unsure, always check this lead closely. 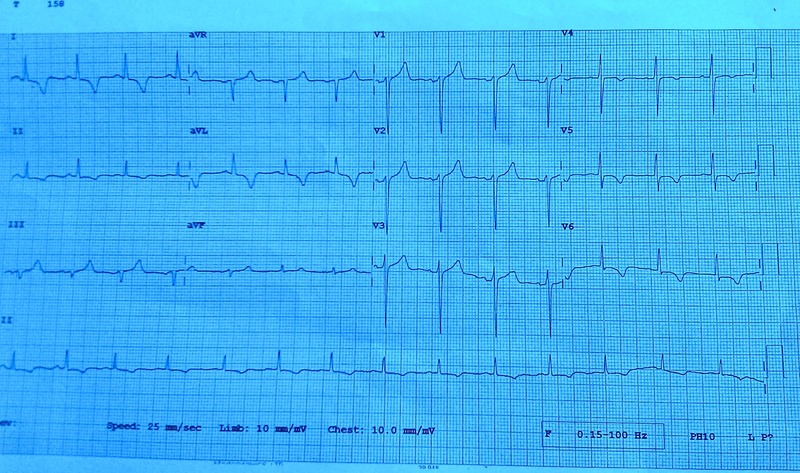 (That said, in the ECG above I think they are clearest in V3 and V4). 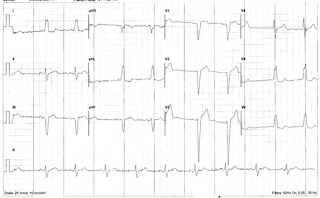 Note how all the ST segments, are deflected in an opposite direction the the associated QRS. This is one of the criteria for LBBB. LBBB makes any further interpretation of the ECG impossible. This is quite possibly incidental to her symptoms. It would be helpful to look back through her notes to see if any older ECG's confirm whether or not this is long standing LBBB. If it is a recent change, then investigations for a possible underlying cause may be necessary. Assuming the conduction impulse starts as normal in the Sino-atrial node, and travels through the atria to the Atrio-Ventricular node, it should arrived safely at the Bundle of His. From there, it should travel down the Left and Right Bundle Branches and into the Purkinje fibres within the ventricles, without delay. 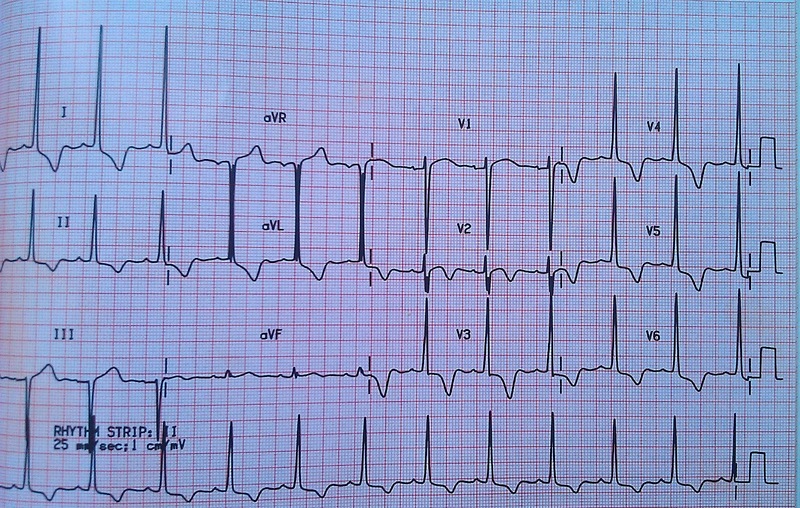 Any delay in conduction, in either the Left or Right Bundle Branch, will give rise to a widened QRS complex. (Normal width is 1.5 to 2.5 small squares, or 0.06 - 0.11 seconds). This is then known as Left Bundle Branch Block (LBBB), or Right Bundle Branch block (RBBB). A QRS complex of 3 small squares, or more, is considered broad. In any Bundle branch block, the P waves and PR intervals should remain normal, and constant. (I say this because another cause of QRS widening, is if the depolarisation occurs within the ventricular muscle itself. In these circumstances, a P-wave would not be present. Sometimes called a 'ventricular escape rhythm'). If LBBB and RBBB occur together, this is a complete heart block (same outcome as when the block is within the Bundle of His itself). Any block/delay in the Left Bundle Branch is seen most clearly in the leads that face the left ventricle. Those leads are V5 and V6 and lead I. The ST changes are deflected opposite (discordant) to the dominant QRS complex. RsR waveform should be present in Lead I.
RBBB - I will cover RBBB in more detail another time. But for now, just remember that the QRS will once be again be wide. As the leads looking directly at the Right Bundle branch, are leads V1 and V2, it is in these leads that the RsR pattern will be most prominent. i.e. "M -(R) -W" formation. RBBB makes further ECG interpretation difficult, but as the Right bundle branch is supplying a smaller muscle mass than the left, the ECG changes are less pronounced than with LBBB. LBBB electrical changes are so profound, that any further interpretation of the ECG is impossible. So what about LBBB and ACS / STEMI's? 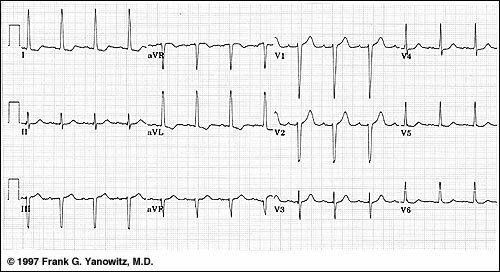 Given the abnormal appearance of the ST segments in LBBB (elevated in V1-4), What happens if this patient presents with chest pain? Imagine this lady returns to see you in an urgent appointment the following month. She is complaining of prolonged chest pain at rest, for several hours. She has no past history of, or risk factors for, IHD, and her symptoms sound very much like acid reflux. Examination is normal and she looks clinically stable. If this lady presents with chest pain, how will you know if the ST elevation is significant? This is a difficult problem. LBBB makes any ST segment analysis very tricky! "Follow local protocols for people with a resting 12-lead ECG showing regional ST-segment elevation, or presumed new onset LBBB consistent with acute STEMI, until a firm diagnosis is made"
This seems very sensible! In view of this we may not have to deal with this dilemma in GP-land....unless of course we are in a very rural location, with secondary care services a long ambulance journey away. 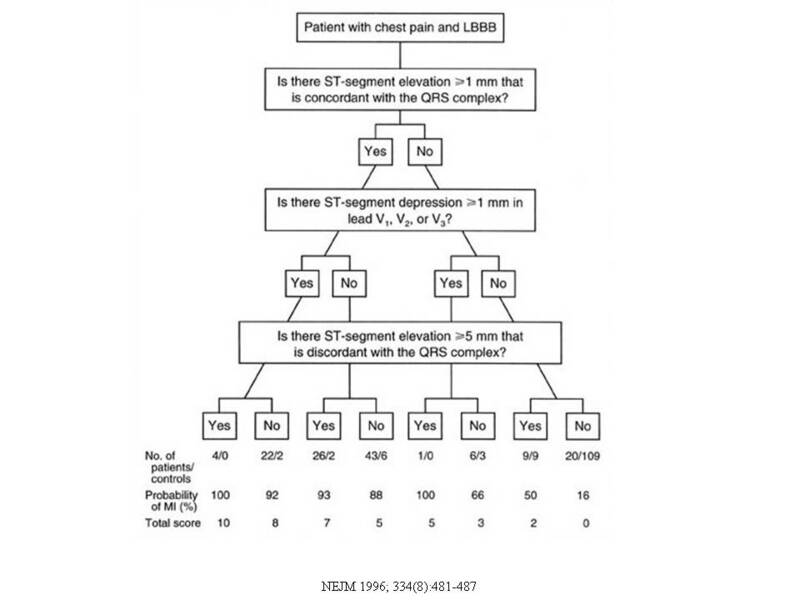 So for the benefit of rural GP's and Paramedics, we have the Scarbossa criteria to assess likelihood of STEMI. Scores are added up to a mximum of 10. where Scarbossa score = 10, the patient has 100% liklihood they are having an MI. In the ECG example above, her Scarbossa score = 0, making the likelihood of this being an MI very low (16%)....but not impossible! Below are examples of a Scarbossa score 7, and a Scarbossa score 10 . Hopefully, you can see how the above two ECG's with LBBB, vary for the example in case 11. This is difficult, and advanced stuff. Unless you are very satisfied clinically, that this is not ischaemic pain, the err on the side of caution, and follow standard chest pain pathways. There you go. All you ever need to know, and more, about LBBB. Q1. What does this ECG show? Q2. 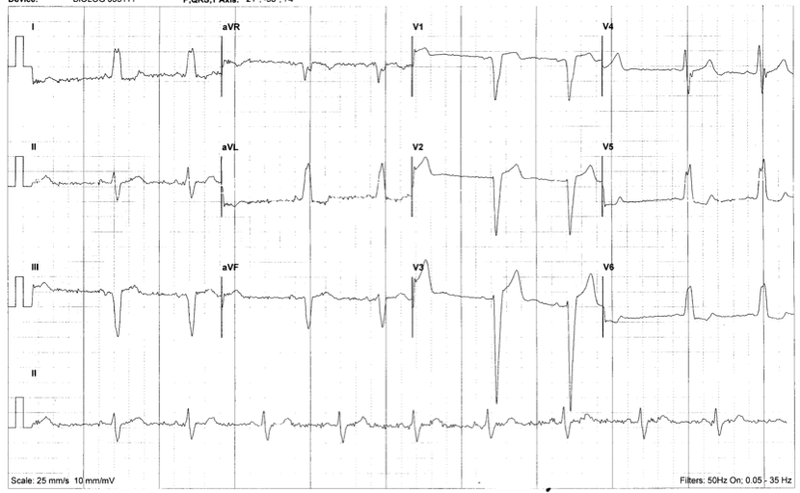 Can you list the causes of LBBB? So what about ACS / STEMI's in the presence of a LBBB? 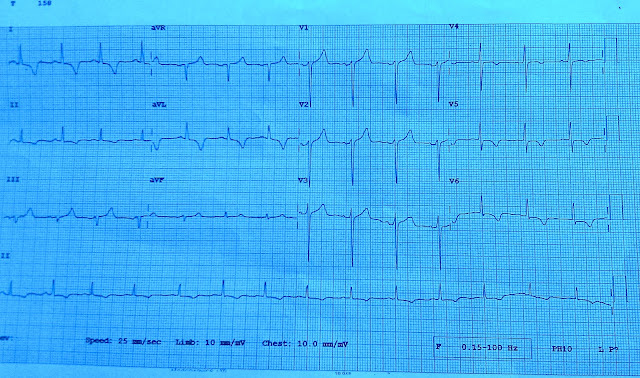 Given the abnormal appearance of the ST segments in LBBB (elevated ST segments in V1-4), what happens if this patient presents with chest pain? Q 3. If this lady had presented with chest pain. How would you know if the ST elevation is significant? Sometimes this is triggered by exertion, sometimes at rest. It can be prolonged, often lasting several hours and on occasions, all weekend. He considers himself fit and active, so he light-heartedly dismisses his symptoms, and works through his 'mild' discomfort, which is very localised in the left upper chest, without radiation. He has no arm pain, no dizziness, and no breathlessness. He has only presented under duress from his wife. He is a non smoker, with no risk factors for IHD and not on any medication. His BP is normal, as always. However, you do hear a systolic heart murmur at the left sternal edge. It wouldn't be wrong to admit this man, on the basis of his rest pain, and ECG changes. Given his dismissive nature, he may take some persuading, but with rest symptoms he is at risk. You can't reassure him that nothing adverse will happen if he stays at home. At very least, it should prompt an urgent referral to the RACPC. In the meantime he should be started on aspirin/beta-blocker and a statin and given GTN/999 advice. The referral should include his ECG and make note of the murmur. (Note: Not all RACPC are set up with ECHO facilities, so if this information is included in the referral, an "ECHO on arrival" request can be made by the clinician receiving the referral). In this case, an ECHO confirmed severe Aortic stenosis. As such, an ETT is contraindicated. 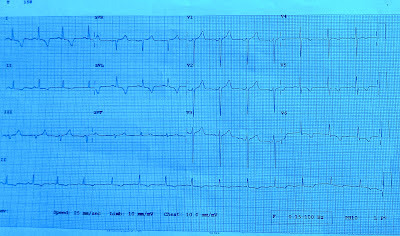 Note the similarities in the two ECG's. However, in this second example, there is gross voltage criteria for LVH (fulfilled in Leads I, aVL, V1-6). There is widespread T-wave depression, and typical of LVH, T-wave inversion in the leads which face the left ventricle (i.e. leads I, aVL, v4-6). T-wave inversion is also seen in leads V2 and V3. This is suggestive of other pathology, such as co-existing coronary disease. He considers himself fit and active, so he light-heartedly dismisses his symptoms. His job involves heavy labour, but he 'works through' his mild discomfort, which is very localised in the left upper chest, without radiation. He only came to see you, under duress, from his wife. He is a non smoker, with no risk factors for IHD, and is not on any medication. His BP is normal, as always. However, you do hear a systolic heart murmur at the left sternal edge. He's sitting in front of you, feeling 'great' and looking clinically well. At the time of his consultation/ECG, he is pain free, but he admits the pains can come and go several times a day. This 56yrs lady attends for a well-woman BP check. After 3 repeated measurements, a minute apart, her mean BP is 146/92.